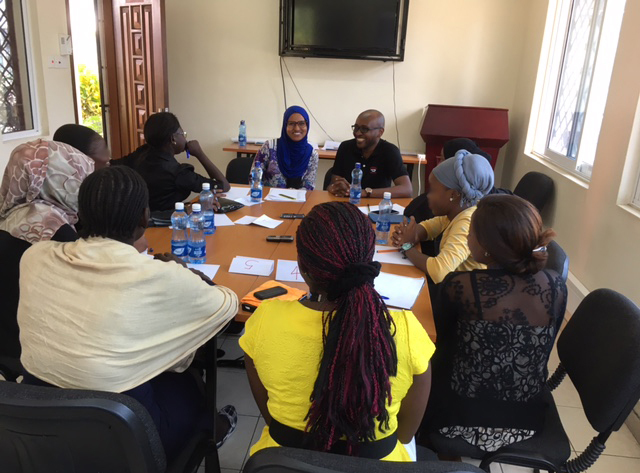 Zahra Mohamed conducts focus group in Mombasa, Kenya. The objective of the behavioral section of the TLC-ART program is to measure preferences among potential end users for long-acting regimens. These preferences will be used to guide the TLC-ART drug development process. Conducting focus groups with key populations in Sub-Saharan African was recommended by the external advisory committee as an important component of the acceptability research. Under the auspices of Dr. Susan Graham’s “Key Challenges” protocol and Dr. Scott McClelland’s “Exploring Women’s Lifecourse Events & HIV Transmission Potential: A Qualitative Study” protocols, Dr. Jane M. Simoni, along with Zahra Mohamed and George Wanje, completed collecting additional acceptability data in Mombasa, Kenya through a series of focus groups with study participants in the Ganjoni HIV care facility. The team also explored current experiences with ART and other factors influencing acceptability. Analysis is ongoing. The team gratefully acknowledge the generous collaboration of UW colleagues Drs. Graham and McClelland, as well as the participation of the patients and assistance with recruitment and administration from the expert clinic staff.